Quite a few years ago, I read a couple of books by James Ricklef: Tarot Tells the Tale: Explore Three Card Readings Through Familiar Stories and Tarot—Get the Whole Story: Use, Create & Interpret Tarot Spreads. In both books, Ricklef demonstrated spreads by doing readings for fictional characters as if they’d consulted him for help about the problems in their stories. Yesterday, I wanted to do a reading, but I didn’t have any pressing questions of my own. I remembered Ricklef’s books and I’ve been meaning to try this for a while, so it seemed like a good time. I’d just finished rereading a fantasy novel called Three Parts Dead by Max Gladstone (and I highly recommend it, but that’s another post). It was fresh in my mind, so I pretended that the main character, Tara Abernathy, was asking me to do a reading for her. Since unlike Ricklef’s examples, I’m using a book that many people won’t be familiar with, I’ve added a few notes for clarification. Warning: major spoilers ahead for Three Parts Dead. I’m a new associate at the Craft firm of Kelethres, Albrecht, and Ao. I’m on probation, my boss is sticking her neck out for me, and if I fail, my career and possibly my life are over. It’s my first case, and opposing counsel is the guy who got me thrown out of school—from about a thousand feet up in the air. I want to beat him even more than I want to win the case. Can we win? Will the firm keep me on? And will we defeat Alexander Denovo? Since I was practicing techniques, I started with the First Operation (not shown). Although the Knight of Wands doesn’t appear in the spread, it seems like a good significator for Tara. She nearly gets herself killed twice in the early part of the book through good intentions carried out enthusiastically without considering all the ramifications. 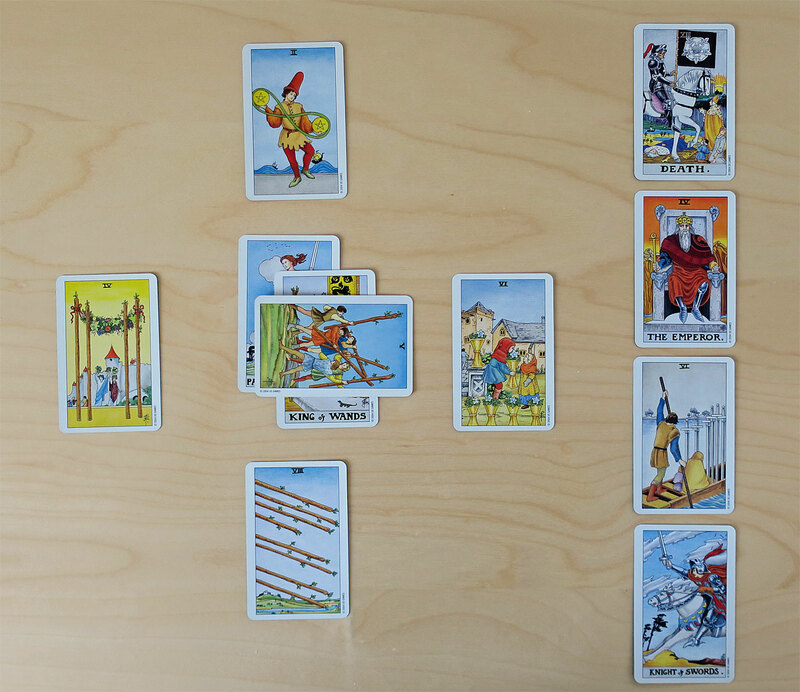 The Knight of Wands appeared in the fourth (earth) pile, so I tried to take a pragmatic, results-oriented approach to the reading. You: Page of Swords. This card represents you right now as you’re asking for this reading. The Page of Swords is clever, good with words (and Craft), and devious when the situation calls for it, but she lacks practical experience. I’d love to be able to tell you to take your time and learn at your own pace, but you’ve described a tense situation, and cards like the Eight of Wands and the Knight of Swords hint that things are moving quickly. So see how watchful and aware the Page looks? Stay alert and be careful. Situation: King of Wands. Fire of fire, this card most likely represents the fire god Kos Everburning, whose death is the reason you’re in Alt Coulumb in the first place. Challenge: Five of Wands. Struggle and conflict: the court case, the various creditors fighting over Kos’s debts and obligations, dealing with Shale, the Blacksuits…need I go on? Kos is the reason you’re here; this is the fight that being here involves. I know you want to hurt Denovo, but watch yourself: it can be easy to lose yourself in the fight and let anger overrule your better judgment. Foundation: Eight of Wands. It’s all coming at you at once: your new position and how much rests on your proving yourself, settling the matter of Kos’s death before his obligations come due at the dark of the moon, the murder of Judge Cabot and hiding the gargoyle, facing Denovo in court, tracing Kos’s private dealings. Everything is top priority. Attitudes and Beliefs: Two of Pentacles. All that stuff I mentioned back at the Eight of Wands—the Two of Pentacles shows you’re concerned about keeping on top of it all. Reading in a vertical line from bottom to top, there are all those problems coming at you in the Eight of Wands, and you as the Page of Swords don’t have a lot of experience handling all this. Communication is vital, but you need to figure out what to say to whom to strengthen your position—and when to keep your thoughts to yourself. The Two of Pentacles shows you trying to manage all these issues. This whole situation is testing your ability to adapt to changing circumstances. It won’t be easy, it’ll stretch you to your limits, but the man hasn’t dropped those pentacles, which suggests you’ll manage. Near Future: Six of Cups. The Six of Cups is one of those cards that references the past, even when it’s sitting in a future position, as it is now. We just saw that the part of your past relevant to this reading is your time at the Hidden Schools and your graduation from there. I read the Six of Cups here as showing someone from your past offering you a gift. Maybe someone older than you, since the boy in the card looks older than the girl. The person who best fits this description tried to get you killed, so I’d be really careful about taking any favors from him in the future. Notice how the little girl isn’t reaching to accept the flowers that the boy is offering her. You as You See Yourself: Knight of Swords. You’d like to show your boss, the firm, and Denovo that you’re qualified, capable of winning, and, well, right. You wield the Craft and your knife [see book cover] as the Knight wields his sword. Remember, though, you don’t have a lot of experience yet. Focus, choose your battles, and prioritize—don’t charge at everything and everyone or you’ll waste your energies. Hopes and Fears: The Emperor. You dream of becoming a respected, powerful Craftswoman. However, you know powerful authorities are either waiting to see how you’ll do (the senior partners in the firm) or are actively working against you (Denovo). Oh, that was fun! I should try this again sometime. *Tara Abernathy is also in Four Roads Cross. I haven’t read it yet, but its mere existence suggests that her life will become unsettled again. Fine Print My catch-all blog, lately focusing on reading.